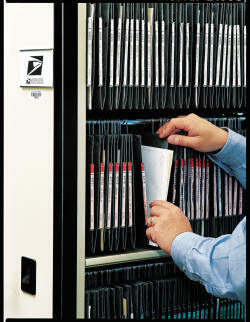 Hanging files and suspended pocket folders by Oblique Filing Systems are a specialty of HD Files. Oblique Filing Systems has been in business for 40 years. They have been providing unique solutions to a wide variety of document management problems. The Oblique hanging filing system provides the easiest, most efficient way to file paper, loose documents, and any other hard to manage documents. 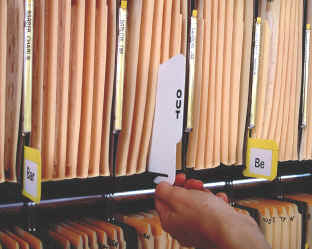 By moving the label from the top of the hanging folder to the side, Oblique is able to make maximum use of vertical space, increasing your storage capacity by utilizing the space normally wasted in traditional filing cabinets. But Oblique is more than a hanging folder. Oblique is the only manufacturer of hanging files to warranty their product against defects for 10 years. Products offered by Oblique Filing Systems are: Kwik Rail Assemblies, Color Keyed Indexing, Label Print Plus Software, CKI Custom Shelf Guides, Golf Bag Storage, Unifile Hanging Folders, Executive Drawer Compartments, and Indexing Products. 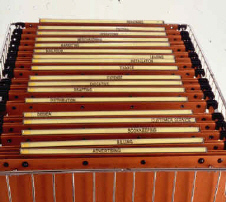 Oblique’s products can be used in virtually any style or make of shelving, cabinetry, or high density filing system. 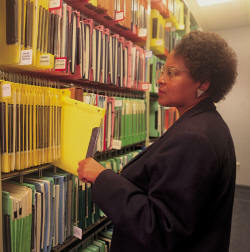 Some applications in use with Oblique products are: Periodical Storage, Computer Printout Storage, Annual Reports, Negatives, Personnel Records, Artwork, Legal Documents, Government Documents, X-Rays, Printing Plates, Sheet Music, Photographs, Historic Documents, Video Cassettes, Accounting Records, Golf Bags, Film Cans, Evidence Files, and Audio Tape Reels. 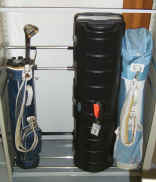 These are just some of the items that can be stored / organized using Oblique products.